To schedule a reading or speaking engagement, please fill out this form. November 5: Reading at the Poetry Foundation (w/ Sarah Gambito). Chicago, IL. More details to come. June 13: Poets Dinner to benefit the Center for Poets & Writers at OSU-Tulsa. Tulsa, OK. More details to come. May 23-24: Union College. Schenectady, NY. More details to come. April 12 @ 10:30 am: “In Raptures: Writing the Ghazal.” Tulsa LitFest, Tulsa OK. Details & Registration here. April 11 @ 7:30 pm: The University of Central Oklahoma. Heritage Room, Nigh University Center. Edmond, OK.
March 30 @ 6 pm: Commonplace Offsite Reading (w/ Jericho Brown, Marcelo Hernández Castillo, Erika Meitner, Morgan Parker, Tommy Pico, TC Tolbert, Sarah Vap, and Yanyi). Passages Bookshop. Portland, OR. March 30 @ 9 am: "Challenging Tokenization: Writers of Colors Respond." AWP Conference. Portland, OR. March 29 @ 8:30 pm: Filipinx Poets Read: An AWP Offsite Event (w/ Hari Alluri, Asa Drake, Jan-Henry Gray, Luisa Igloria, Michelle Penaloza, Barbara Jane Reyes, Janice Sapigao). Bota Bar/Bar Botellón, Portland, OR. March 29 @ 4:30 pm: "From Words to Music: Writers on Collaborating with Composers." AWP Conference. Portland, OR. March 22 @ 6 pm: Third Thursday Poetry Series. Jule Collins Smith Museum of Fine Art, Auburn University. Auburn, AL. March 14: Reading and Craft Talk (w/ Oliver Baez Bendorf). Grand Valley Writers Series. Grand Valley State University, MI. November 10: "The Poetics of Fury: Creative Reading" (w/ Kathryn Nuernberger, Taneum Bambrick, Jennifer Maritza-McCauley, and Jenny Molberg). C.D. Wright Women Writers Conference, University of Central Arkansas, AK. November 1 @ 1:30 pm: Publishing Roundtable. University of Oklahoma, Norman, OK.
October 27 @ 6 pm: Dream Without Limits Gala. The University of Central Oklahoma, Edmond, OK.
October 16: Seminar and Reading at the Lannan Center for Poetics and Social Practice (w/ Marcelo Hernández Castillo). Georgetown University, Washington D.C.
September 20 @ 7pm: Ai Reading Series (w/ Luisa Muradyan). Modella Art Gallery, Stillwater, OK.
September 18 @ 6:30 pm: September Poetry Series (w/ Brent Newsom). East Central University, Ada, OK.
June 2 @ 8 pm: American DREAMers: Stories of Immigration concert. Philadelphia Episcopal Cathedral, Philadelphia, PA.
May 21 @ 7pm: Reading at So & So Books (w/ Marcelo Hernández Castillo). Raleigh, NC. May 20 @ 2:15 pm: Women Writers Panel (w/ Carmen Maria Machado, Rebecca Peters, and Ashley Lumpkin). Greensboro Bound Literary Festival. Greensboro, NC. May 19 @ 11:15 am: An Undocupoets Reading and Conversation (w/ Marcelo Hernández Castillo). Greensboro Bound Literary Festival. Greensboro, NC. May 18 @ 8 pm: Bull City Press House Party Reading Series (w/ Marcelo Marcelo Hernández Castillo). Hillsborough, NC. May 12 @ 11 am: "World Into Word" Generative Writing Workshop Leader. Metropolitan Library Literary Festival. Oklahoma City, OK.
May 5 @ 11 am: "Satellites, Adoptees, and Undocumented Immigrants: Kundiman and Undocupoets Present Underrepresented Asian American Narratives" (w/ Marci Calabretta Cancio-Bello, E. J. Koh, Anni Liu, and Ansley Moon). Massachussetts Poetry Festival. Salem, MA. April 25 @ 7 pm: We Need Diverse Books Panel and Reading (w/ Cindy Pon). Grossmont College. El Cajon, CA. March 10 @ 10:30 am: Small Experiments with Radical Intent (panel w/ Alicia Craven, Desireé Dallagiacomo, Kima Jones, and Ramiza Koya). AWP Conference. Tampa, FL. March 9 @ 3 pm: Undocupoets Speak (panel w/ Suzi F. Garcia, Marcelo Hernandez Castillo, Esther Lin, and Christopher Soto). AWP Conference. Tampa, FL. February 20: Celebrating Books by Oklahoma State University Authors. Anne Morris Greenwood Reading Room, Edmon Low Library, Stillwater, OK.
December 1 @ 7 pm: Reading at the First Friday Art Crawl (w/ Lisa Lewis and John Andrews). The Gypsy Coffee House. Tulsa, OK.
November 9 @ 7 pm: Convocation Series: “Adventures in Interdisciplinary Studies” (w/ Purnaprajna Bangere and Jeffrey Lang). Franklin College, IN. November 1 @ 7 pm: Open Mouth Fall Poetry Festival. Nines Alley. Fayetteville, AR. October 27 @ 7 pm: Cameron University Visiting Writers Series. Lawton, OK.
October 12 @ 4 pm: Reading at Sterling College. Cornerstone Room, Union Bldg. Sterling, KS. October 11 @ 6 pm: Reading at Watermarks Books and Café. Wichita, KS. October 6 @ 1 pm: Poetry Panel. South Central Modern Language Association (SCMLA) Annual Convention. Tulsa, OK.
September 4 - 6: Pellissippi State Community College Convocation Speaker. Knoxville, TN. July 27 @ 2 pm: Kundiman Poetry Reading (w/ Franny Choi, Paul Tran, Gowri K, and Rajiv Mohabir) at the Smithsonian Asian American Literature Festival. Smithsonian National Portrait Gallery, Washington, D.C.
July 25 @ 4:30 pm: Summer Literary Salon #3 (w/ Elizabeth Hazen, music by Sofia Ortiz), Rose O'Neill Literary House at Washington College, Chestertown, MD. May 18 @ 8 pm: The Only Tenn-I-See Reading Series, Last Days of Autumn Brewing, Knoxville, TN. May 13 @ 3:15 pm: Workshop Critique and Reading at the OKC LitFest. Oklahoma City, OK.
May 13 @ 7:30 pm: Special Mother's Day performance of From My Mother's Mother. Flushing Town Hall, Flushing, NY. May 13 @ 9 am: Poetry Workshop Leader. OKC Litfest. Oklahoma City, OK.
May 6 @ 2 pm: Reading in Santa Fe (w/ Chen Chen, Mary Cisper, and Jane Lin). op.cit bookstore, Santa Fe, NM. April 22 @ 5 - 7 pm: No Human Being is Illegal: Undocupoets Reading (w/ Javier Zamora, Marcelo Hernandez Castillo, and Christopher Soto (aka Loma). MOTUS Theater, Boulder, CO.
April 11 - 12: Bunker Hill Community College. Boston, MA. April 8: Oklahoma Book Awards. Oklahoma City, OK.
April 3 @ 5 pm: Undocupoets Reading (w/ Christopher Soto aka Loma). Indiana University, IN. February 20 @ 7 pm: Visiting Writers Series at Brookdale Community College (w/ Matthew Olzmann). Warner Student Life Center, Lincroft, NJ. February 18 @ 6:30 pm: Inprint Poets & Writers Ball. The Houstonian, Houston, TX. February 10 @ 3 pm: Alice James Books New & Emerging Authors Reading (w/ francine j. harris, Jamaal May, Matthew Nienow, and Matthew Olzmann). AWP Conference, Washington, DC. February 9 @ 1 pm: Driving without a License book signing. AWP Conference, Washington, DC. February 9 @ 9 am: Girlhood, Womanhood, Coming of Age (panel and reading w/ Aliki Barnstone, Laura Donnelly, Cornelius Eady, and Janet McNally). AWP Conference (Marquis Salon 1 & 2, Marriott Marquis), Washington, DC. January 27 @ 7 pm: Gulf Coast Reading Series. Rudyard's Pub, Houston, TX. January 26 @ 8:30 pm: Poison Pen Reading Series. Poison Girl Bar, Houston, TX. Poems: A Reading (w/ Chinaka Hodge, Donika Kelly, and Solmaz Sharif). Miami Book Fair, Miami, FL: November 2016. Visiting Writers Series at Northwest Academy. Portland, OR: October 2016. Asian American Literature Today: Kundiman Spotlight (w/ Aimee Nezhukumatathil, moderated by Jen Chang). Library of Congress, Washington, DC: October 2016. Oklahoma State University Faculty Reading (w/ Sarah Beth Childers). Oklahoma State University, Stillwater, OK: October 2016. Lillian Vernon Reading Series (w/ Solmaz Sharif and Ocean Vuong). Lillian Vernon Creative Writers House, NYC: September 2016.
visceral brooklyn Reading Series (w/ Damilola Michael Aderibigbe, Jared Daniel Fagen, Alice Sola Kim, and Kimarlee Nguyen). Unnameable Books, Brooklyn, NY: September 2016. Kundiman at the Bryant Park Reading Room (w/ Patrick Rosal, Franny Choi, and Jee Leong Koh). Bryant Park Reading Room, New York, NY: June 2016. Emo Fru + Kundiman: Driving without a License (w/ Sahar Muradi, Chialun Chang, Sokunthary Svay, Vikas Menon, Julia Munslow, Hieu Huynh, Rachel Ansong, Samina Hadi-Tabassum, Ansley Moon, and Marina Blitshteyn). The Botanic Lab, New York, NY: May 2016. Poetry Poetry IV (w/ Ocean Vuong and Wendy Xu, hosted by Jennifer Hayashida). Asian American Writers' Workshop, New York, NY: May 2016. Reading and Q & A at Union College, Schenectady, NY: May 17-18, 2016. "Inspired by Wonder: A WITS Reading" (with Lacy M. Johnson, Marc McKee, and Renee Flagler). AWP/Los Angeles, CA: April 2016. Poesia Peligrosa: A reading hosted by PODER and Teatro Quinto Sol. UC Riverside, CA: February 2016. City Arts Reading Series (w/ Eric Howerton). Salt Lake City Public Library, Salt Lake City: September 2015. 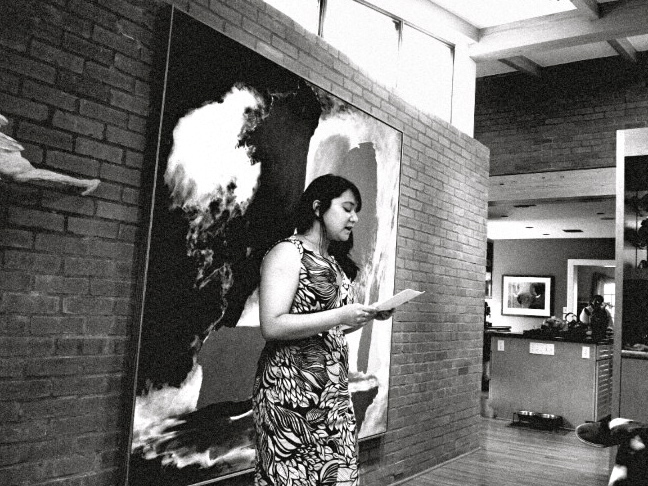 Transatlantic Poetry (w/ Shruti Iyer). Live reading online. June 2015. "The Poem and Social Space." Panelist (w/ Ken Chen, Randall Horton, and Lupe Mendez). Facing Race: A National Conference, Dallas: November 2014. “Migrants, Monsters, and Mutants.” Panelist (w/ Tamiko Beyer, Joseph O. Legaspi, Bushra Rehman, and R.A. Villanueva. Massachusetts Poetry Festival, Salem: May 2014. “Migration Histories - Total Recall or Selective Amnesia? The Uses and Abuses of History in the Immigration Discussion.” Panelist (w/ Israel Pastrana and Chris Newman). Weber State University Diversity Conference, Ogden: October 2013.